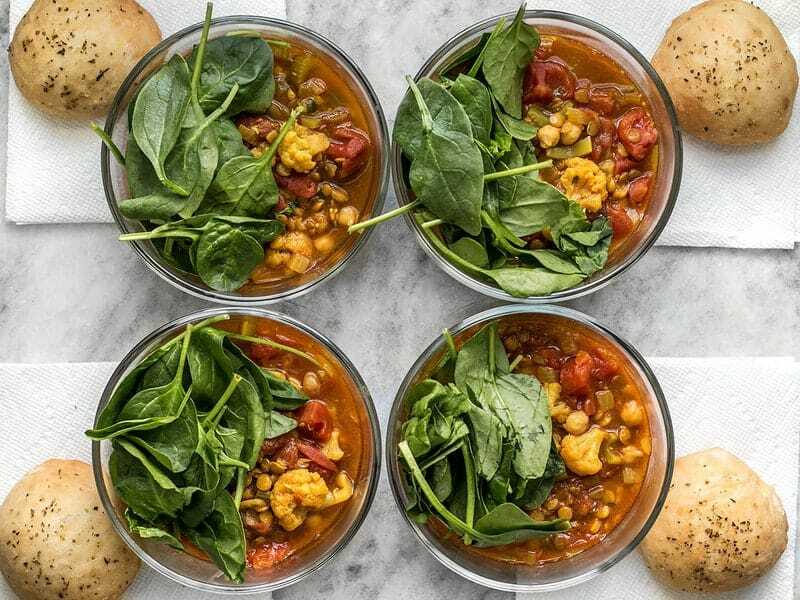 I’ve reached the end of another week and I once again feel like I’ve over indulged and need some vegetables in my life, so I reached into my archives and decided to revive my Moroccan Lentil and Vegetable Stew for this week’s meal prep. OMG you guys, I forgot how insanely good this soup is!! That cinnamon is so warm and delicious in this savory soup. The scent really does tickle your brain. Anyway, I paired it with my super easy Focaccia Rolls (begin these the night before) and then since I wanted to add more green to the meal, I just added a handful of fresh spinach to each bowl instead of cooking a separate side dish. The spinach will get stirred into the soup and will wilt when reheated, providing even more vegetable-y goodness to the soup! 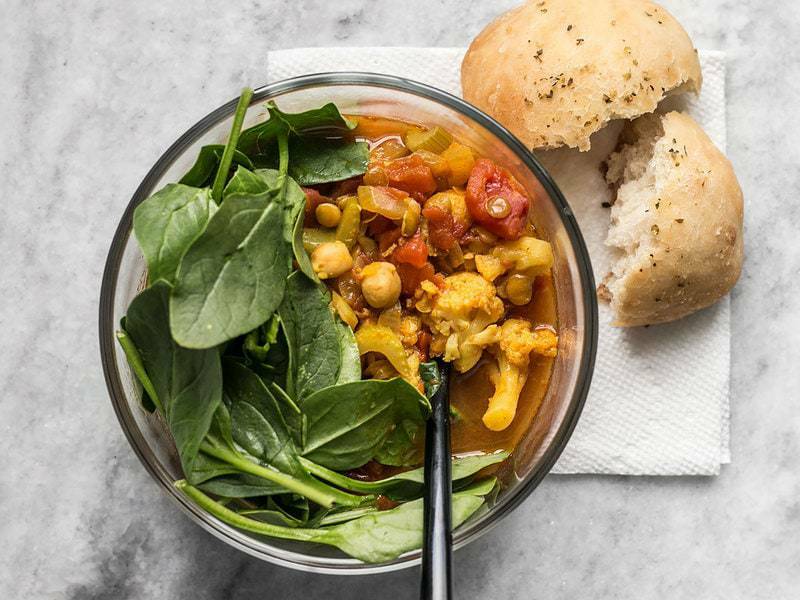 The Moroccan Lentil and Vegetable Stew recipe makes about 8 1.5 cup servings. 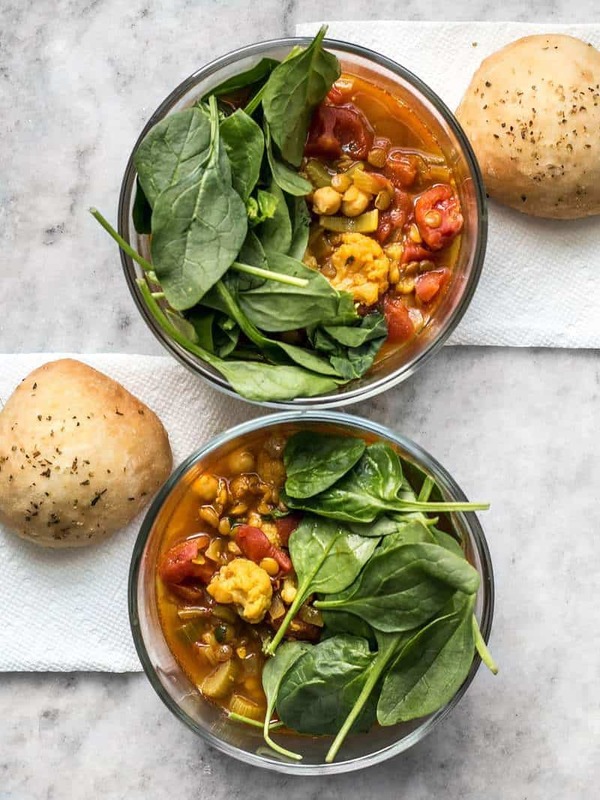 Luckily, this soup freezes great, so you can stash the other four in the freezer. Or do six servings of 2 cups each and stash two servings in the freezer. The Focaccia Rolls recipe is super easy to cut in half, which gives you six rolls. They also freeze beautifully (after baking), so you can either make a full batch and freeze a bunch of them, or just freeze the extra two (or eat the extra two during the week because they’re just really delicious). Don’t forget to begin the focaccia dough the night before. It needs to ferment at room temperature for 12-18 hours. If you can’t get to the dough before 18 hours, you can pop it in the fridge to press “pause” on the process and then let it come back to room temperature before you shape and bake them. To store the Focaccia rolls I simply wrapped each one in a fold-top sandwich bag. Seriously though, who wouldn’t be jealous of that lunch?? And yes, I did get new containers! I wanted a round container for soups and bowl meals (like Bibimbap) and these Pyrex 4-cup containers seemed pretty perfect. This is my first time using them so I can’t vouch for durability and spill proof-ness just yet, but I’ll update in future posts! The soup is so bomb. I did add about a tsp of curry powder to round out the flavor. This week I did two type of chicken, roasted cauliflower, squash, and broccoli, and braised greens. Thank you for the inspiration! Oooh, I haven’t seen those containers! I’ll have to look for them in the store. 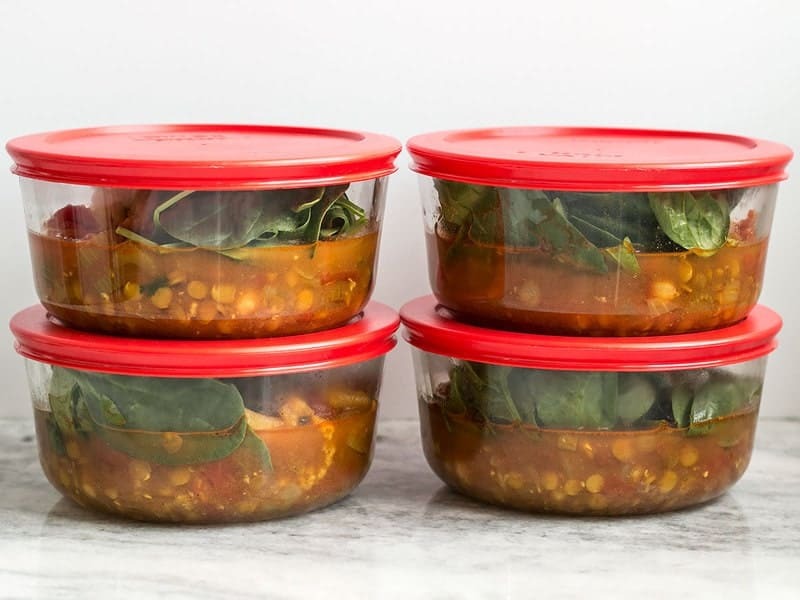 More praise for the round Pyrex containers. : i use them for baking, in bain marie, and pot in pot in my electric pressure cooker. This is a good selection for a mason jar, too, which is unlikely to leak, although not quite as easy to eat from as a bowl. This stew is one of my favorites of your many terrific recipes. Like Danielle, I often freeze stews and soups in bags. I have a large assortment of that Pyrex. I’ve added to it over the years, but my initial assorted set was a wedding gift from 2005. Still have them! I wouldn’t just chuck the bowl of soup into a backpack and expect it to not leak all day, but I’ve never had problems with the bowls (I have 1, 2, 4, and 7 cup) when placed in a lunch box. I have experienced leakage with the 3 cup rectangles. The corners aren’t as secure. Also, something I do with my Pyrex, I portion out certain recipes into these and freeze them. Once frozen I pop the solid mass of food out and put them in freezer bags. When ready to defrost and heat I can grab one from the freezer and put it back into the Pyrex. I have hard pucks of multiple homemade soups in my chest freezer. Typically do a big batch cooking of soups/stews in the fall and then we’re good for winter! Do they pop out pretty easily from the containers without doing anything to them beforehand? Or do you have to run hot water from the sink over them first? Pyrex containers are the best! I’ve been using them in all sizes for over six years and they’ve never spilled on me! I do want to find a couple of square glass containers though for sandwiches, etc. because they seem too big for them.